The 1973 coups d'etat in Uruguay and Chile were significantly different from other military coups in Latin America. These two dictatorial regimes began a new era in the subcontinent. They became staunch bearers of a National Security State doctrine and introduced radical new economic policies. More tellingly, they gave birth to extreme models of society built on the foundations of what can arguabl… y be considered ideological genocides, relying on both rudimentary and sophisticated methods of repression and authoritarianism to establish neoliberal systems that have lasted until today. 2013 marked the 40th anniversary of the fall of democratic rule in those countries. After four decades, the governments of Uruguay and Chile continue to show deficiencies in bringing the perpetrators of severe human rights violations to face justice. 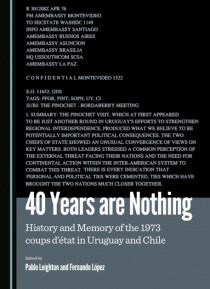 40 Years are Nothing: History and Memory of the 1973 coups d'etat in Uruguay and Chile is inspired by the strong memories that these coups still create. The range of topics addressed in the contributions gathered here demonstrate that the 1973 coups continue to be key points of interest for researchers across the globe and that the study of these topics is far from exhausted.